The Seattle Food & Wine Experience is coming up soon, and I, for one, am really looking forward to the event. 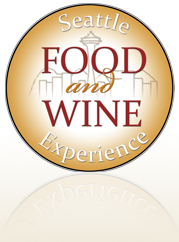 On February 28th between 1-5pm the wine and culinary worlds will converge in the Seattle Center Exhibition Hall. Winemakers from ten different countries will be available, as well as special "Pavilions" for certain regions, including Washington, Oregon and California. Other countries, such as Italy, France and Australia will also be showing their wares. I'm looking forward to seeing some Northwest favorites like Delille Cellars and Kiona Vineyards as well as TOWB favorite Terra Blanca. In addition to the wine, food will also be a major part of the experience, with chefs from nearly 20 restaurants providing appetizers to pair with the wine. The event proceeds benefit Beechers Flagship Foundation, an organization that looks to educate kids in fourth to sixth grade about the risks and realities of food additives. Tickets are $49 in advance and $59 on the day of the event. Admission comes with 50 tasting tickets, with each tastings 'costing' between 1 and 3 tickets. No matter how you do the math, you're going to have a great experience. I hope I'll see you there.